I have a Birds of Texas Field Guide by my back window. In our old neighborhood, Betty—who lived next door—used to feed the birds and we had a steady stream of beautiful visitors. When we moved to our new house several years ago, there were no birds, so we started putting out seed. This weekend, it iced to the point that we couldn't get the cars down our steep driveway. So, I spent Friday working from home at my kitchen table. When I put out seed, I threw some on the porch so that I could watch the birds pick it up. There is something so enjoyable about watching birds just being birds. Hopping about and pecking. After awhile I noticed that not all the little birds on the porch were sparrows. 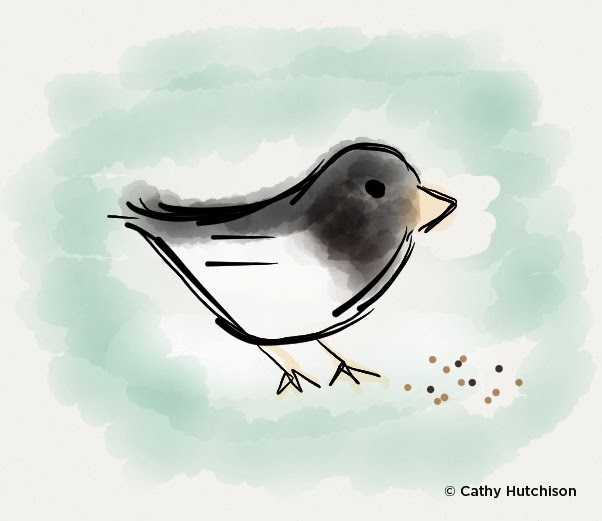 So, I grabbed the Field Guide and discovered they were juncos—who normally live in Canada and the northern states but migrate in the winter. I marked them in the Field Guide whose index has become a visitors log of sorts.